The E182E supports HSDPA 3G data transfers of up to 21.6Mb/s - provided the network can manage it, of course. That's the downlink - upload speeds run to 5.76Mb/s, Huawei said. The retractable USB connector pops out at the push of a switch and locks into place during use. You'll have seen this trick on USB Flash drives. 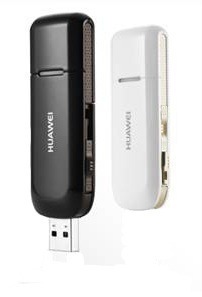 And in a nod to the design's origins, Huawei said it will offer the E812E with up to 32GB of storage on board.